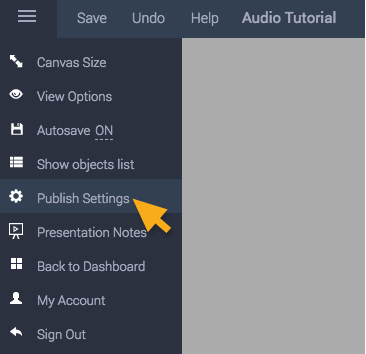 Along with using the Audio Tool, you can also add Background Music to your entire presentation by going to the Publish menu. You can easily do so by clicking on Menu at the top left of the screen and select Publish Settings dropdown. You can also click the Share button in the top right menu bar in between Preview and Download. If you do use the Share button, you will get to the “Share Online” page. Click on Advanced Setting where it will prompt you to Publish Settings page. Note: If you are using the Publish Settings dropdown from the menu on the top left, ignore clicking the Advanced Setting because it will go directly there (Step 2). Click on Audio Controls options to find Background Music option and turn on/off. Once you have done that, click the down arrow to choose the background music file. Set the Loop on/off if desired.